Not sure I feel good about this. Tahquitz Rock to be be used as a laser screen for the 4th of July. I think USFS needs to review this for compliance withe Wilderness Act and environmental laws. I think it needs an emvironmental impact statement to proceed. I imagine it would fail that test. I hope Wildhorse is correct. What a crap idea. Let's teach people that nature is ugly and not worth looking at unless we project a bunch of artificial colors onto it. I don't know, I don't think it necessarily sounds like a bad idea. There is no trash or fire danger created, so it seems neutral at worst to me. It isn't taken as insulting to show it on the face of the Great Pyramid, and by 9:00 at night you can't see the wilderness anyway since it's dark. It probably won't be all that impressive, but it might be harmless and could turn out to be fun. I'd like to see how it pans out at least once. I won't be there to see it, but if any of the locals see it, I hope they'll post and give it a review. 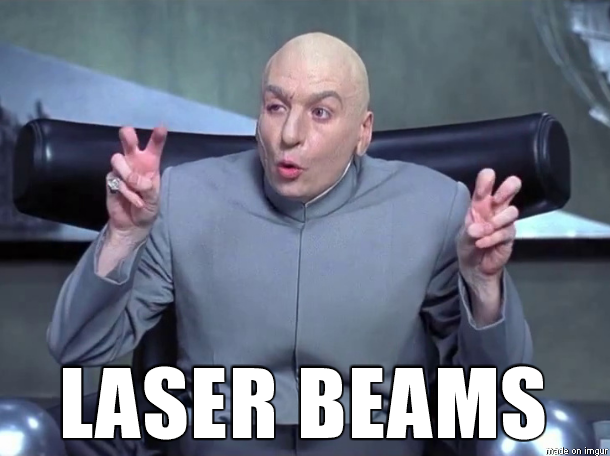 How can anything with lasers be bad? Ha Ha Ha jfr! Love it! I think it is a pretty cool idea, as long as the logistics are planned out so that there will not be traffic messes, unruly celebrator issues, etc. The folks planning the event should be responsible for footing the bill for traffic control and law enforcement. Idyllwild has a somewhat struggling economy (look at the way restaurants open, close, change hands on a weekly basis!) that could benefit from a few extra tourism dollars. I think they should give it a try at least once. If it proves to be a disaster they don't need to do it again. I will be celebrating Independence Day evening on San Gorgonio Peak! Have a safe and sane Fourth of July, everybody! I looked at the law today. I believe it would violate that law having to do with the character of wilderness and risk to wildlife. I don't think the usfs even has authority to make an exception. The persons putting this on and the Towncrier appear to be unaware. The usfs rangers have a tough job sometimes. Many people don't know the Wilderness Act or its meaning. And some people know and don't care. It is a pity. It sounds like a great idea to me plus the article says; "Laserium Daystar is obtaining all necessary permits ". As far as affecting the local wildlife; unless an animal stares at the beam (that's being displayed on an almost vertical surface) there will be no harm. Heck, the Ivanpah Solar Plant does way, way more harm than this show every would. It's an opportunity to bring in some money to the local economy too. Hope there are no climbers left up there. Sunset in Idyllwild is currently about 8pm, and that is followed by 24 minutes of civil twilight. I would hate to be descending the ledges on the down route at 9pm, and have a laser flashed in my eyes.